A cynical rock hack might argue that Manfred Mann made a career out of Bob Dylan in the 60s and a career out of Bruce Springsteen in the 70s. Manfred Mann might agree. He might even suggest that he made a better career out of Dylan than Dylan did in the 60s, and a better career out of Springsteen in the 70s than Springsteen did. Manfred took Dylan’s Mighty Quinn to No.1 and If You Gotta Go, Go Now to No.2 – neither of which Dylan bothered to release as singles at the time – and scored a US No.1 in 1976 with Springsteen’s Blinded By The Light – something Springsteen has never done. Manfred first heard Blinded By The Light on Springsteen’s debut album, Greetings From Asbury Park – or rather, he missed it. Manfred had bought the album on the recommendation of a Philadelphia radio DJ. He was one of a modest number of people to buy it – certainly not enough to trouble the chart compilers. 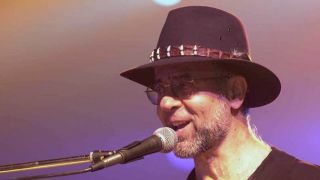 Top of his potential singles list was Spirits In The Night, which he recorded in 1975, but which failed to make any impact. The following year he turned his attention to Blinded By The Light for Manfred Mann’s Earth Band’s The Roaring Silence album. “The original version – which didn’t get on to the album – was very long and elaborate, quite different to what you hear now,” he says. “I spent ages fiddling with it, and eventually realised that if we cut out the stopping and starting at the end of every verse then we could get somewhere. I knew there was some magic in it, particularly at the end with the two voices singing the verse and chorus together. In the UK Blinded By The Light got to No.6 in the autumn of 1976. reviving Manfred’s fortunes which had been in the [self-inflicted] doldrums after he’d disbanded the Manfred Mann pop group in favour of his wilfully uncommercial Chapter Three. In America the single did even better, climbing slowly but surely to No.1 despite – or maybe because of – some controversy over the lyrics. It was another self-inflicted wound. Once Manfred had learned Springsteen’s original, he hadn’t listened to it. “I find that if you keep referring back you can get over-familiar with it and start to think it’s better than your lousy version,” he says with dry irony. But he hadn’t checked the lyrics, and somehow ‘Cut loose like a deuce’ became ‘Wrapped up like a deuce’. Worse still, that line sounded more like ‘Wrapped up like a douche.’ Manfred blames the azimuth on the tape machine [something to do with the angle of the tape head on the tape], and does a convincing Alan Partridge impression as he wraps his facial muscles around the words ‘deuce’, ‘douche’ and ‘dooce’ – which is what they finally managed to get it back to after more fiddling about with the tape. “The funny thing is that afterwards people came up to me and said: ‘You know why that record was such a hit, don’t you? Because everyone was trying to figure out if it was ‘deuce’ or ‘douche’,” he says. So it may be just as well that Manfred never succeeded in his plan to have Springsteen sing one of the two vocal lines at the end of the song, combining the verse and the chorus. Instead Manfred sang the part himself. It is allegedly the only time you can hear Manfred’s voice on a record.